A former National Guard pilot was arrested Thursday and charged with attempting to plant bombs on a Wisconsin military base in an incident that appeared to be aimed at U.S. involvement in Kosovo, officials said. "We are taking this as a very serious act of international terrorism," FBI special agent Brian Manganello said. The devices were later defused. A man broke into the Wisconsin Air National Guard base Wednesday and dropped two live bombs when he was chased away, leaving behind graffiti including the phrase "Free Kosova" scrawled in red paint on a satellite dish. "Kosova" is the Albanian spelling for "Kosovo." Milan Mititch, 36, of Milwaukee was arrested at his home following a tip, according to FBI spokesman Barry Babler. Babler said Mititch was a U.S. citizen though his ethnic background had not been determined. Mititch was charged with violations of federal explosive laws and with attempting to place a destructive device proximate to an aircraft, Babler said. After the incident at the National Guard base, investigators contacted local Serbian and Albanian communities and went door to door in some neighborhoods with a composite sketch of the intruder, Williams said. The sketch was broadcast on Milwaukee TV stations. It was unclear how the intruder got in to the National Guard base. Authorities say the suspect had no credentials that would have allowed him to get past the complex gate. The base, located at Milwaukee's Mitchell Field, is the home of the 128th Air Refueling Wing, elements of which were sent to Britain in 1999 to back up NATO air missions over Kosovo. NATO air strikes against the Yugoslav provinces of Kosovo and Serbia in 1999 helped end Serb oppression of Kosovo. NATO soldiers remain in the region to help oversee a fragile peace. A former chief warrant officer, Mititch flew UH60 Blackhawk helicopters for a unit that was not assigned to Kosovo and did not participate in the Gulf War, said Lt. Col. Tim Donovan, a guard spokesman. 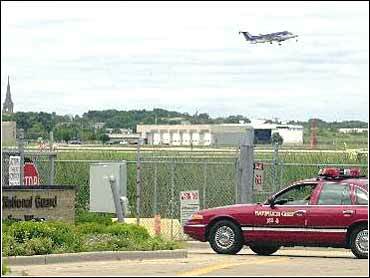 Mititch, a pilot for American Eagle, a regional carrier for American Airlines, was a member of the Wisconsin Army National Guard from 1988 until he resigned Nov. 1, Donovan said. Police records show Mititch was arrested in 1998 for allegedly spray-painting "U.S.A.=Satan" on a Milwaukee shoe store after watching President Clinton on television. The charges were later dismissed. The Air National Guard compound in Milwaukee reopened Thursday although a sign reading "actual threat condition" remained posted outside the base's main gate. A steady stream of visitors flowed in and out as the workday resumed.